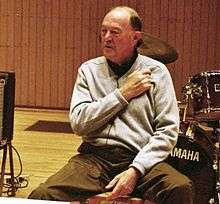 Andrew "Andy" White (27 July 1930 – 9 November 2015) was a Scottish drummer, primarily as a session musician. He was affectionately christened "the fifth Beatle" as he is best known for replacing Ringo Starr on drums on the Beatles' first single, "Love Me Do". White was featured on the American 7" single release of the song, which also appeared on the band's debut British album, Please Please Me. He also played on "P.S. I Love You", which was the B-side of "Love Me Do". Andy White was born in Glasgow, Scotland, on 27 July 1930, the son of a baker. At the age of 12, he started playing drums in a pipe band, and became a professional session musician at the age of 17. In the 1950s and early 1960s, White played drums with a number of swing and traditional jazz groups and musicians. In 1958 he formed a big band jazz outfit and took it to the American Northeast where he backed rockers like Chuck Berry, the Platters and Bill Haley & His Comets. White said, "We used some big band arrangements and put a back beat to it to fit in with the rock 'n' roll thing. I got the chance to hear rock 'n' roll in the flesh. That was where I got a good idea about what it was supposed to happen, drumwise." In 1960 in London White recorded with Billy Fury on Fury's first album, The Sound of Fury, which is generally regarded as Britain's first rock and roll album. In September 1962, White received a call from Ron Richards asking him to attend a Beatles recording session at the EMI Studios at Abbey Road in London. Richards was record producer George Martin's assistant at the time and had used White in the past. The Beatles had recorded "Love Me Do" twice already: at an EMI audition on 6 June 1962 with Pete Best on drums when he was still a member of the group; and again on 4 September 1962 with Ringo Starr on drums, Starr having replaced Best the previous month. Martin had disapproved of Best's drumming and was now also unhappy with newcomer Starr's drumming. On 11 September 1962 Richards, who was in charge of recording that day, wanted the song recorded again, and the Beatles played "Love Me Do" a third time, this time with White replacing Starr on drums and Starr relegated to playing tambourine. "P.S. I Love You" was also recorded during this session with White playing a "lightweight cha-cha-chá beat" and Starr playing maracas. White says he was paid £5 for the session and 10/- (50p) for bringing his drum kit, and did not earn any royalties from the sale of the records. The version of "Love Me Do" with Starr playing drums was used on the early British pressings of the single in 1962. The version with White playing drums was used on the first American pressings of the single in 1964, all later releases of the single, on the Beatles' debut British album, Please Please Me, in 1963, and most subsequent albums that included the song. The version with Starr on drums has also been reissued on occasion; it appeared on the Rarities (1980) compilation, which was released in North America, and received worldwide release on the Past Masters compilation in 1988. A 1992 single included both the Starr and White versions. An easy way to distinguish between the two versions is that White's version features Starr on tambourine; Starr's version does not include a tambourine. The Pete Best version of the song, initially thought to be lost, was released for the first time on Anthology 1 (1995). "P.S. I Love You", with White drumming, was released on the "B" side of the "Love Me Do" single, and on the Please Please Me album. In a 2012 BBC interview, White claimed that during 11 September session he also played on a recording of "Please Please Me" and this performance was used on the hit single: "From the drum sound I can tell that I was on it, because it was a vastly different sound to Ringo's drumset at that time. This was before he got the Ludwig kit. Each drummer gets an individual sound, first of all by the way they tune the drums and then by the way they play the drums." 1 2 3 4 5 6 7 Eder, Bruce. "Andy White". AllMusic. Retrieved 7 January 2010. 1 2 3 Ingham, Chris (2003). The rough guide to the Beatles (Illustrated ed.). Rough Guides. p. 18. ISBN 1-84353-140-2. 1 2 3 Marck, John T. "Love Me Do". I Am The Beatles. Archived from the original on 19 December 2009. Retrieved 8 January 2010. 1 2 3 4 5 6 7 8 Jordan, Chris (23 May 2008). "'Fifth Beatle' Andy White is still keeping time". myCentralJersey.com. Retrieved 7 January 2010. 1 2 3 "Who backed The Beatles?". Something Books. Retrieved 8 January 2010. ↑ Dunn, Brad (2006). When They Were 22: 100 Famous People at the Turning Point in Their Lives. Andrews McMeel Publishing. p. 143. ISBN 0-7407-5810-1. ↑ Thompson, Gordon (2008). Please Please Me: Sixties British Pop, Inside Out (Illustrated ed.). Oxford University Press. p. 63. ISBN 0-19-533318-7. ↑ MacDonald, Ian (2005). Revolution in the Head: The Beatles' Records and the Sixties (Second Revised ed.). London: Pimlico (Rand). ISBN 1-84413-828-3. 1 2 Cross, Craig (2005). The Beatles: Day-by-day, Song-by-song, Record-by-record. iUniverse. p. 399. ISBN 0-595-34663-4. 1 2 "Love Me Do: The Beatles '62". BBC Four. 7 October 2012. 1 2 "Love Me Do: The Beatles '62 (excerpt)". 9 October 2012. ↑ Harry, Bill (2000). The Ultimate Beatles Encyclopedia. MJF Books. ISBN 1-56731-403-1. 1 2 "Andy White, early Beatles drummer, dies aged 85". BBC News. 11 November 2015. Retrieved 12 November 2015. ↑ Borack, John M (2 January 2009). "B-Sides the Beatles". BNet. Retrieved 8 January 2010. ↑ Racioppi, Joseph. "Caldwell resident has big Beatles connection", The Progress, 17 September 2009. Accessed 31 January 2011.